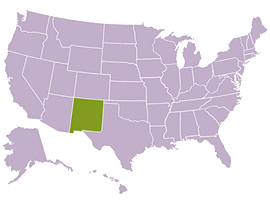 There are 58 local and national banks serving the financial needs of their customers in the state of New Mexico with 434 branches in 87 cities and towns. You can click the logo of a bank on right to view the list of all locations of your preferred banking company in New Mexico or choose a city & town from the list below. The largest banks in New Mexico with most branches are: Wells Fargo Bank with 78 offices, U.S. Bank with 31 offices, Washington Federal with 24 offices, Bank of America with 22 offices, Bank of the West with 22 offices, BBVA Compass with 18 offices and Bank of Albuquerque with 17 offices.